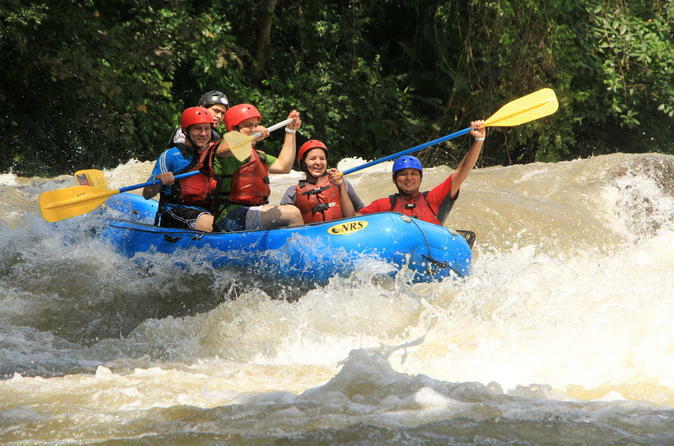 Here, you are going to read about the top five rivers to go white water rafting in Costa Rica with rapids ranging from Class I to Class V.
With rapids ranging from Class I to Class V, you can take it slow or go extreme. Even if you are an experienced white water rafter or adrenaline junkie, it’s always nice to have options for something easy. Be sure to check out our complete guide to things to do in Costa Rica for planing your trip. 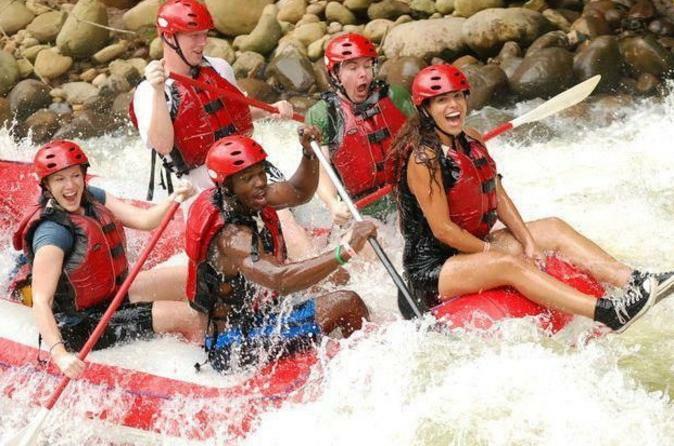 Let’s get started so you can get to rafting in beautiful Costa Rica! Then we’ll discuss tips for first time rafters and the best times to go. 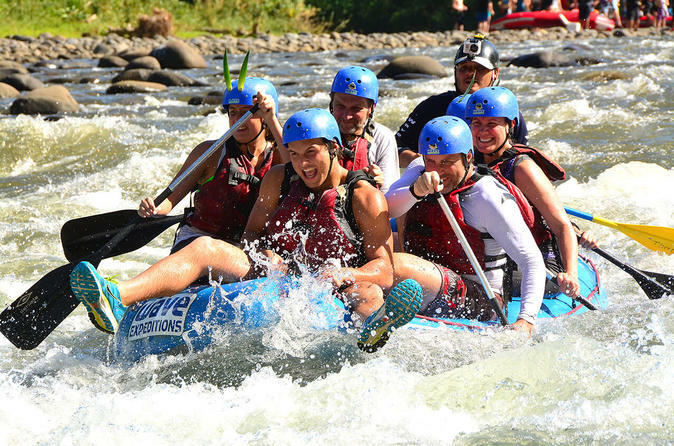 Whether you are planning a one-day rafting activity or your entire holiday revolves around rafting the rapids of Costa Rica, choosing the the best river to raft on for your ability and the time of year are your two most critical decisions. Some rivers provide calmer more relaxed waters with Class II and Class III rapids while other more extreme rapids can be found as well. Also known as Bull River, it can be a rough river with rapids ranging from Class II to Class IV. 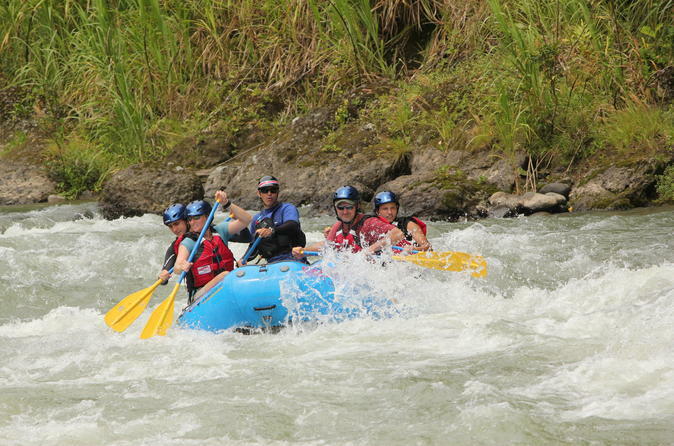 It isn’t for the faint of heart but a thrill seeking beginner or a more experienced rafter would take great pleasure in being able to ride some of the best rapids in all of Costa Rica. The majority of the journey down river is a constant flow through Class III and Class IV rapids with a few Class II thrown in to allow you a short break to catch your breath. Río Toro is a great place for visitors seeking adventure and looking to avoid dull moments of simply floating down stream. After you finish rafting down Bull River, you can stop and visit the beautiful sights of the tropical forest that surrounds the river. 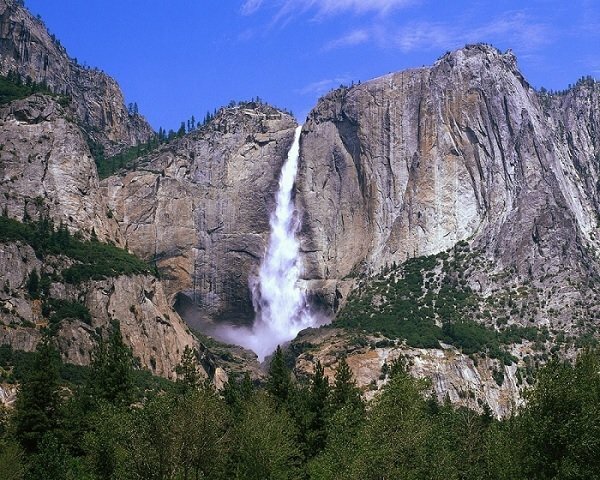 Between the exotic wildlife, towering waterfalls, and natural hot springs, it’s sure to be a trip that won’t easily be forgotten. With this tour you have a choice between the Rio Toro river or the Sarapiqui river. Either one will be adventure filled with class III and IV river rapids. The 13 mile tour runs past the Poas Volcano for some dramatic views. After you get picked up at your hotel, the tour starts with a 1.5 hour scenic drive through papaya and pineapple plantations where you end up at the base of the volcano. 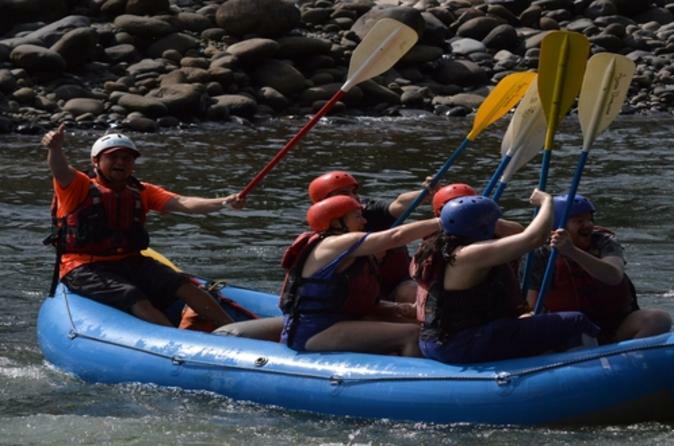 After a safety briefing by the experienced guides you will embark on your journey where not only will you get to experience some of Costa Rica’s best rapids but also some of its most beautiful rainforests. At the halfway point you will go ashore for a break and enjoy some snacks and a swim. At the end of the tour you will get to enjoy an authentic Costa Rican lunch. The Pacuare river stretches for 18 miles, cutting a winding, curving path through the beautiful and lush rain forest. Over the course of the 18 miles of river, you will travel through more than 50 different rapids. Though the rapids in this river aren’t extremely intense or difficult to travel through, with such a large number of rapids over such a long distance, you will be sure to be exhausted and ready for a nice long nap at the end of your adventure. But don’t let being tired stop you from enjoying the beauty of the rain forest. With amazingly beautiful plants and animals combined with the complete isolation from city life, you will find it easy to relax and enjoy every moment from the minute you arrive to the time you leave to go home. This is a great river for beginners and experienced rafters a like. The long journey down river makes it a challenge but with many easier rapids, instead of a few intense rapids, you will have plenty of time to just relax with bursts of excitement here and there. 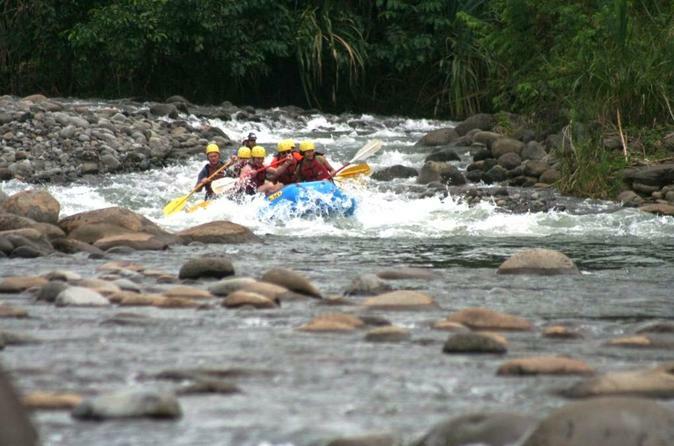 The Pacuare River is the most recognized river for whitewater rafting in Costa Rica – and with good reason. Sheer cliff walls covered in green moss and vegetation line both sides of the river along several stretches of the Pacuare. Beautiful, massive granite and sandstone boulders are also found along the route. Its extreme remote location makes for a daylong adventure into a jungle region of Costa Rica that is largely uninhabited. The local rafting guides are knowledgeable and professional. Highly-recommended! This river is divided into two different sections, Pascua and Florida, and is known for being probably one of the most difficult and challenging rivers in all of Costa Rica. Year around, even during the dry seasons, this river still manages to have high water levels with a seemingly constant supply of white water. Choosing between with the Pascua or Florida part of the river may be difficult because both provide an awesome white water adventure, consisting mostly of Class III rapids throughout the entire journey down river. 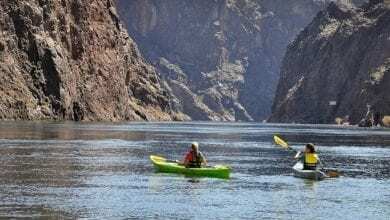 This is a great river to visit any time of year and is definitely a must raft river, especially for those experienced riders looking for the next best rapids. This 10 mile stretch of the Reventazon River has something for every rafter. The first half of the trip features long rapid runs up to Class III with nice size waves. Then the rafts are beached at a beautiful lunch picnic spot. After lunch you enter a thick jungle section of the river that is calmer and home to Costa Rican rain forest wildlife. The tour is guided by knowledgeable pros. After the day’s rafting you will be able to shower, change clothes and enjoy a cool drink before heading back to civilization. This river is divided into three parts. Combined, the river covers 35 kilometers through the rain forest. In some sections of this river, there are quite a few Class IV and Class V rapids that will bring excitement and joy to even the more experienced rafters. That isn’t to say that isn’t a great place for beginners as well, other places on the river have much calmer Class III and lower rapids, as well as calm water that are perfect for enjoying the scenery. 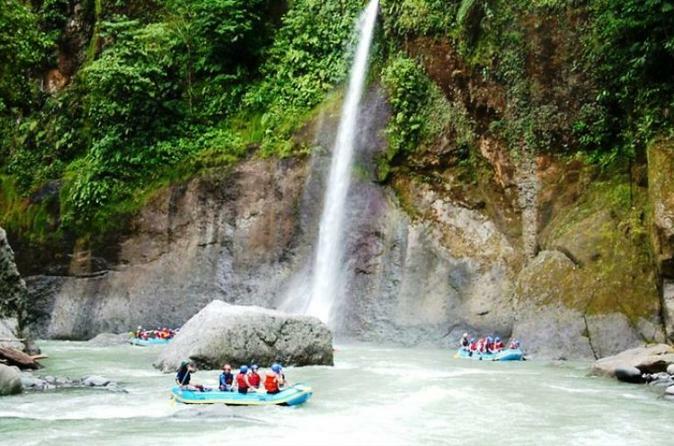 The Sarapiquí River is known for its scenery and many people also call it the scenic river. With something for rafters of all experience levels, as well as animal lovers, bird watchers and fans of nature, this river is a great place to visit while you are in Costa Rica. You’re in for an exciting day on the Sarapiquí River with this tour. Ideal for beginner to intermediates with a minimum age requirement of 14. Since the rafting tour goes through class III and class IV rapids, you need to be in good physical condition, able to paddle. The 14 mile tour goes through some of Costa Rica’s most lush and thick tropical rain forest. So when you are not on the rapids you can enjoy the view of the rainforest and see and hear the wildlife. The experienced guides will walk you through every step of the way so don’t worry if you have never been rafting before. This is an adventure you won’t soon forget! 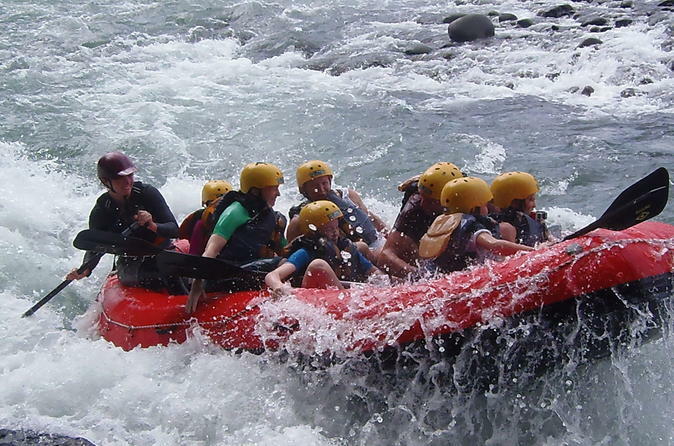 This Sarapiqui River tour offers you the best of both worlds; adventure and nature! There is a combination of class II and III river rapids so it’s ideal for beginner and intermediates. This 2 hour rafting tour will take you through some of Costa Rica’s most lush and beautiful rainforest regions. You not only get to raft the river but lunch is also provided where you can swim and jump in the river from surrounding cliffs. You have the option of being picked up from your hotel in either San Jose or La Fortuna. The certified and experienced guides will have you on the water in no time after a safety briefing. When you are rafting a river with rapids that are named “Terminator” and “Dos Locos” you know you’re in for some adventure! This relatively short tour of 6 miles will go through 30 separate rapids so you are in for nonstop ride. There is a photographer following you to get some great action pictures, hopefully not of you falling out of the raft! At the halfway point, you will get a break for snacks and depending on where you stop, you may get to swim in the river and do some cliff jumping if you are feeling particularly adventurous. After the tour is over you will have the opportunity to have an authentic Costa Rica lunch and have a shower before heading back. This is the perfect river for beginners with fast flowing water, and an array of Class I and Class II rapids. If you are looking for a nice relaxing and tranquil trip down the river this is a great place for the whole family, with rapids even small enough for the kids to enjoy. Since the water is constantly moving, there is very little need to paddle so you and the kids can enjoy the beauty of the nature that surrounds the river. If you are lucky, you might even get a chance to see some wildlife in the process. If your looking for something slower or maybe want to bring the kids along, this Corobici River tour is for you. There are plenty of sights all along the way while you float through the rain forest. You can expect to see (and hear) howler monkeys, ospreys, iguanas and sloths. Your guide will point out all the sights so you don’t miss anything! This tour lasts about 2 hours winding through the jungle. At the end of the relaxing and informative tour, you will enjoy lunch then see the Las Plumas Jaguar Rescue Center. This private reserve has a variety of wildcats, as well as monkeys and birds. One of the most important things to remember in rafting is to always put safety first. 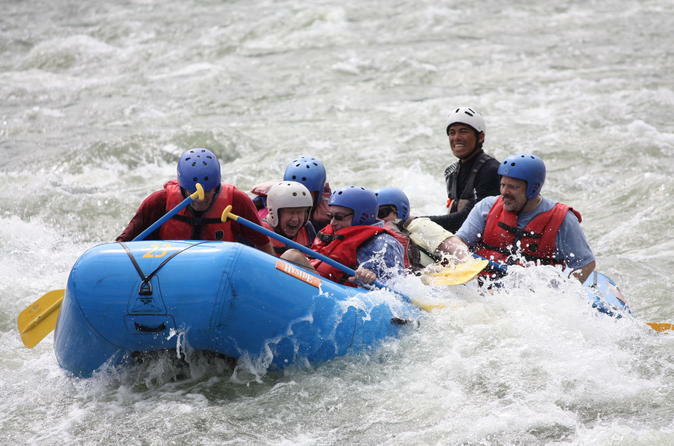 Rafting is fun but even on smaller rapids you can be in for a bumpy ride. Your guide is there to keep you safe and make sure you have a fun and memorable experience but they are also there to get you home safely so that you are able to share stories of those experiences with your friends and family. Even if you have been doing this for years, you still need to listen to your guide. When they are explaining safety to you before you start down river, in calm waters and especially when you are going through a rapid. They will explain important commands and things that you need to know to keep you and your fellow rafters safe. 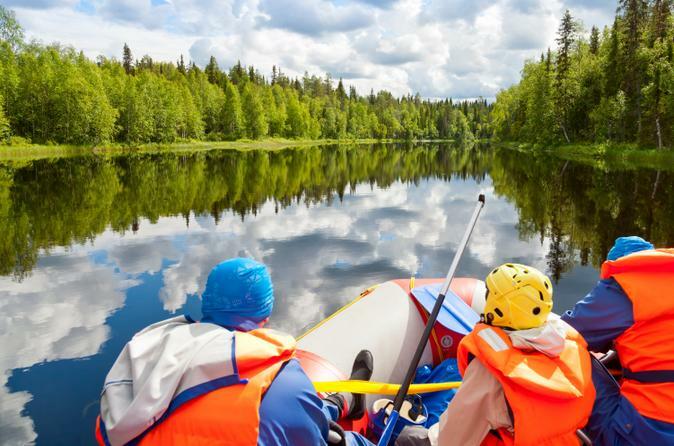 You will be given a life jacket and a helmet – it is critical that you wear these at all times. Even a world class swimmer should wear this gear. Water is a powerful force of nature and if you get knocked out of the raft for any reason, you will be thankful you have your gear on. Even if it is a little bulky and uncomfortable, it is definitely better than cracking your head against a rock or getting pulled under a big wave. Be smart and be safe – wear your helmet and life jacket. The MOST important thing to remember: DON’T PANIC! Especially if you fall out of the raft. If you panic, you are just wasting time that you could be spending reacting to the situation. Remain calm and always revert back to rule number one under things to know: ALWAYS listen to your guide! You aren’t going for a Sunday stroll through the park and you are definitely going to get wet. You will want to wear clothes and shoes that you don’t mind getting wet. For the ladies, a swimsuit with a t-shirt and shorts is perfect for clothing. Gentlemen, you can wear your swim trunks and a t-shirt. Water shoes, or something like outdoor sandals are probably your best bet. You want something that will stay on your feet so no flip-flops, or you might be going home without shoes. Also remember, you will be wearing a life jacket so you probably won’t want to go shirtless or only wearing a bikini top because the life jacket might rub against exposed skin and cause irritation. I cannot stress this enough. Even if it is an overcast or cloudy day, sunscreen is a must! You need a nice heavy duty waterproof sunscreen, at least SPF 30+ but SPF 50+ is preferred. Cover any and everywhere that there is exposed skin. Your face, ears and neck are the most obvious places but if you are wearing shorts that expose your knees, put sunscreen on your knees as well. 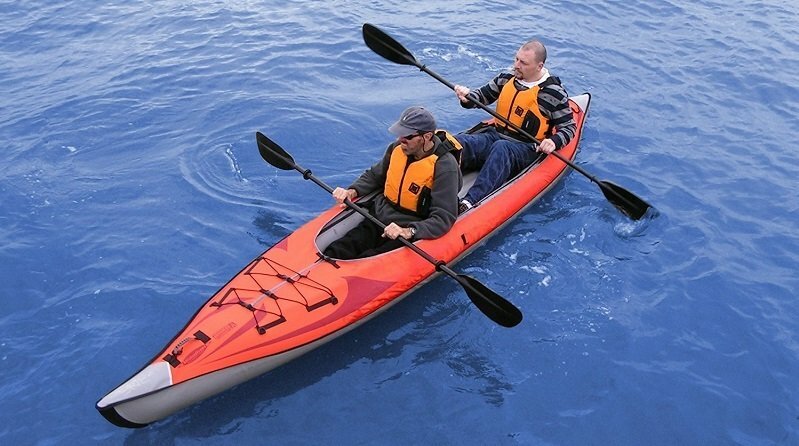 Other areas to consider are arms and shoulders, the tops of your feet if they are exposed, your chest and any area that isn’t covered by your life jacket. Don’t bring anything with your that you won’t mind getting wet or even possibly floating down river without you. Cellphones, money, credit cards, cameras, water bottles, sunglasses, or anything else you might consider taking with you should be sealed in a waterproof container and safely secured. Things of value are probably best left hidden away in your car and some rafting places even provide storage lockers you can put your personally belongings in. If you are going to take a camera, think about taking one of the waterproof GoPro cameras. Whatever you do take with you on the raft make sure that it is securely attached to your person. If you were to fall out of the raft, jump out of the raft to go for a swim, or even just be hit by a big rapid, you don’t want your things to get washed away from you before you can grab them. Make sure your guide knows your experience level, and if you are afraid of going on the rapids, make them aware. The last thing you want to do is end up in the middle of a Class V rapid frozen in fear. Rafting is fun but if your guide isn’t aware of your feelings, experience and expectations, it can put not only you but everyone in the raft with you in danger. You don’t want to attempt rapids that you aren’t ready for yet. If you are new to rafting take it slow, work your way up. Even if you stick to Class II and Class III rapids, it will still be a thrilling journey down river. The best time of the year for rafting kind of depends on your preference. 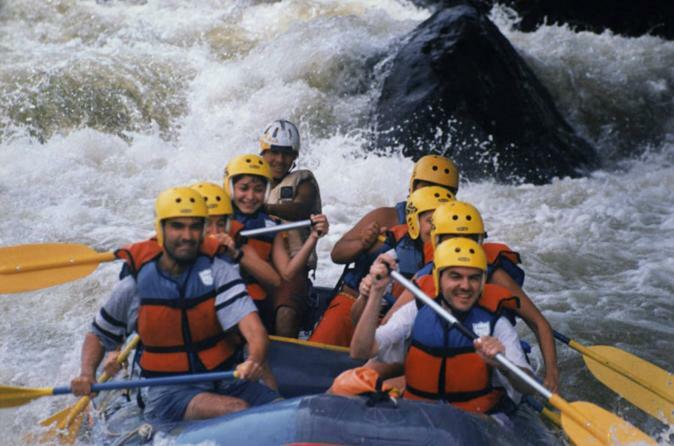 If you are interested in a more intense rafting experience, you will probably want to go during the rainy season. This is generally between June and October. The rapids tend to be slightly more intense during this time of the year because water levels are higher. If you prefer a more relaxed rafting experience or you are a beginner, just looking to get your feet a little wet, you should probably go during the drier season. When water levels are lower due to less rainfall, the rapids aren’t usually as intense as they would be during a wet season. The dry season in Costa Rica is usually between December and April. I don’t know about you but I am certainly ready to book a ticket to Costa Rica and check out the rapids. Thinking about the beautiful places, with various classes of rapids in another country just gets my adrenaline pumping. 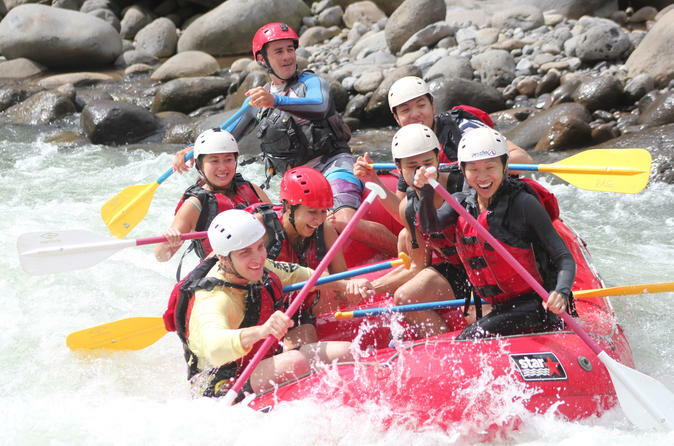 Start planning your next vacation to go rafting in Costa Rica! I hope this guide was helpful for finding the best rivers for rafting in Costa Rica to suite your experience level. If you want to comment or recommend a river or tour I didn’t include, please use my contact form to get in touch. Have fun and be safe out there!